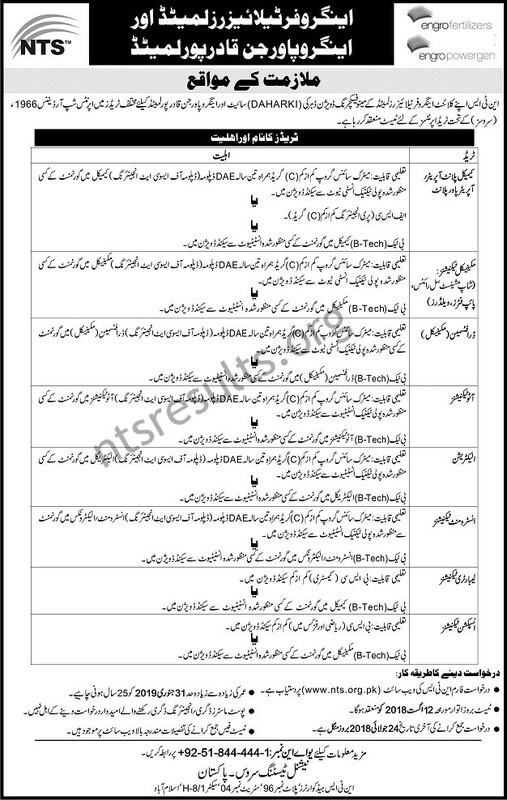 Download application form for Engro Fertilizers Ltd Engro Power Gen Qadirpur Ltd Jobs Via NTS. Last date to apply is Tuesday, 24th July 2018. Engro Fertilizers Limited was incorporated in June 2009. Engro Fertilizers Limited is a subsidiary of Engro Corporation. EFERT is the symbol of Engro Fertilizers in Stock Exchange. Engro is also a leading importer and seller of Phosphate products, which are marketed extensively across Pakistan as phospatic fertilizers. The vision of Engro Fertilizers Ltd is to improve productivity as well as lifestyle for thousands of farmers across Pakistan. 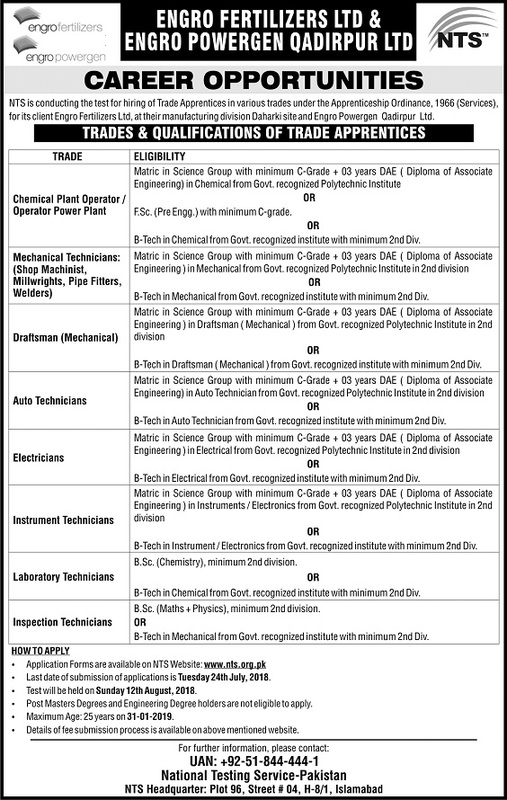 Various jobs has been announce in Engro Fertilizers Ltd Engro Power Gen Qadirpur Ltd. Maximum age require for the job is 25 years. NTS will conduct the test for the hiring of Trade Apprentices in various trade under the Apprenticeship ordinance. All those candidates who are eligible for the Engro Fertilizers Ltd jobs must apply to grab this golden opportunity. Terms & conditions as well as other requirements for Engro Fertilizers Ltd Engro Power Gen Qadirpur Ltd Jobs Via NTS are describe below. Last date of application submission is Tuesday, 24th July 2018. Test will be held on 12th August, Sunday 2018. Candidates cannot apply for more then one post. NTS will not issue the roll no slips to those candidates who have not fill their academic record properly.